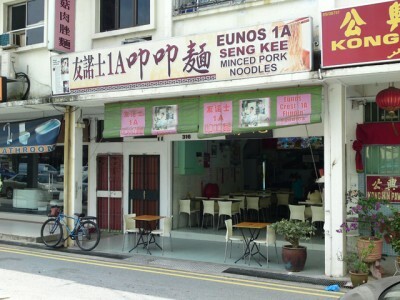 Home / Chinese Cuisine / Eunos 1A Seng Kee Mushroom Minced Pork Noodles – Very Popular But How Good? For someone who resides on the east end of Singapore all his life, I must admit that I grew up eating Hokkien Bak Chor Mee and was introduced to the Teochew version only 10 years ago. When I first ate Teochew Bak Chor Mee, the tik poh(dried sole fish) taste in the soup simply blew me away. Tik pok as we all know, has a nice flavour and can be very SHIOK when combined with minced pork and liver. But that’s about it. The selling point of a Teochew Bak Chor Mee is just the “tik poh soup” for me and nothing more. The dumplings, the sauce, chili, chicken feet or braised pork that I had eaten from Bak Chor Mee stalls didn’t really WOW me and fact is, you can eat those things in many other foods too. For Teochews, salting and pickling is an important art because they orignate from a delta where there are alluvial deposits which means that there are limited amount of cultivable land. So food like rice or vegetables need to be imported from other parts of the country and preserving whatever greens they could get their hands on became a culture. That’s the reason why we can enjoy foods like chai poh(salted radish) or tang chai(salted cabbage) which are all Teochew inventions. Being near to the sea, Teochew is also known for many seafood dishes and consequently, the art of preserving were applied to seafood. That is the reason why we can enjoy preserved seafood like tik poh. 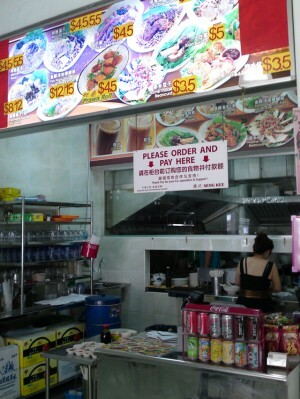 A lot of people give Seng Kee Minced Pork Noodles on Changi Road a five star recognition. Seng Kee Minced Pork Noodles used to operate at Eunos Crescent Blk 1A for a long long time before they moved to it’s current location which was only few years ago. For any hawkers to venture out of a market to rent a shop by it’s own, it must be worth a visit, or so I thought. This place is rumoured to have queues that can be translated into 45 mins waiting time though when I arrived which was around lunch time, there were only 2 customers in the shop. Not sure whether I was in luck but in spite of the near empty greeting, I had very good feeling about the place because the food photos pasted around the shop looked very interesting. I decided to go for a Mee Kia Tah and I must say that at $4.50, it is pretty steep considering I can eat the same thing from many places for $2.50 – $3. At that point, I was just thinking that this may turn out to be a “rich man’s” Bak Chor Mee since there are plenty of private properties in close vicinity. Seng Kee Minced Pork Noodles also serves a lot of side dishes like fried dumplings or prawn rolls to go along with your Mee though I must say the prices of those side dishes mean that I should only eat them if I’m feeling rich. My noodles arrived and it looked just like any other bowl of Teochew Bak Chor Mee I’ve had before. For $4.50, it clearly didn’t score in value. There were a few pieces of pork slice(I skipped the liver), 1 piece of her giao(fish dumpling) and some mushroom slice. I thought the sourness was pretty mild for a Teochew Bak Chor Mee though the overall flavour of the sauce was pretty good. The novelty of the Teochew Bak Chor Mee soup is the anoint of the tik pok, minced pork and braised mushroom. The minced meat and liver flavour here espoused well with the pungent tik poh flavour though it’s pretty clear that there are a lot of MSG used, it can be livelier or too rich, depending on your taste preference. 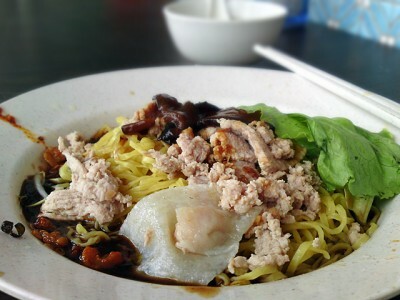 Teochew Bak Chor Mee is all about the Tik Pok flavour which is amazingly unrestrained here. For $4.50, some justifications(or magic if you like!) should be expected but the normality is obvious. If this was $2.50, it would be great. For $4.50, it is good and definitely overpriced. Will definitely come back to try the fish maw soup that everyone’s been raving about and will possibly keep off those side dish items like home-made beancurd, prawn roll or stir fry vegetables. The prices aren’t very cheap for those items and if anything, buying those food from a Bak Chor Mee stall sounds very much like buying a chicken wing from a bakery. 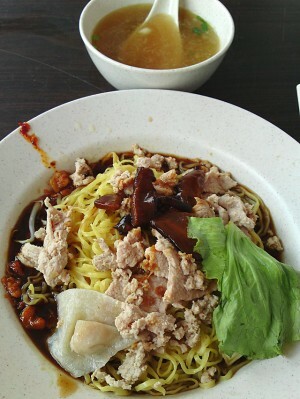 Conclusion: A very delicious Bak Chor Mee no doubt but definitely not the best for me and clearly overpriced at $4.50. The tik tok flavour in the soup is richer here but my thirstiness after the meal may be a sign that too much MSG were used. Definitely not bad for a fix but to a certain extend, I do feel it’s overrated. Maybe the $10 fish maw soup can do a lot better for me, will definitely try it out in my next visit. Likes: Tik pok flavour in the soup is shiok. They are renting the whole shop so you can’t expect coffeeshop pricing there. But I agree that its slightly overated. I usually just order the noodles and stir fry kai lan. Try it next time, quite good. Don’t understand here. How can you recommend something you have not tried (fish maw soup) just because everyone rave about it? Where’s a food critic intergrity? The “bakchormee” is ranked amongst the above average in taste but for the ingredients, Id say is the most generous. Taste and quality doesn’t synch up. That goes as well for the fish maw soup. Will I go back there again? Sure. It is no longer at Changi Rd. Anyone knows where they moved to? Pls adv. Thanks! Btw, this is very good bahchomee. Highly recommended! the shop shifted to Serangoon hawker centre, just next to chomp chomp.